Bakugan MOBILE ASSAULT - Bakugan Mobile Assault Vehicles or BMA are a type of Battle Gear. Unlike other Battle Gear, the Bakugan are attached to them, making it compatible to any Bakugan. When a Bakugan is placed on an closed BMA, it opens up. 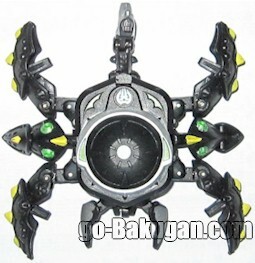 Also, unlike Battle Gear, they have an attribute that must match the Bakugan using the BMA. CORE Bakugan - Earlier and represent the majority release of Bakugans, consisted of mainly Pre-season 2 and Seaon 2 Bakugans. We at go-Bakugan.com has the most complete list of Bakugans, including some of which that has not been release to the public. SPECIAL ATTACK (New Vestroia)- This is a special edition single pack brawlers that consists of three unique features: metal rings around the side or down the center, ability to jump to a card, and attribute changing. They're mostly in milky white color with attribute color accent. TRAP - Traps is a newer special Attack Bakugan. They have unique features and come in many different shapes but not round like regular Core Bakugans. During a battle they're place on gate card to reveal either a different Attribute or G-Power, and can be used in combination with regular Bakugan for even more strategic maneuvering. BATTLE GEAR - Bakugan Battle Gears can be use to attach to some Bakugan to increase G-power, or they can by played just like any other Bakugan. Although they have the same color of normal Bakugan, their symbols are different. Their symbols mean Gold, Silver & Bronze. These colors also correspond to the Gate Cards of the same colors. 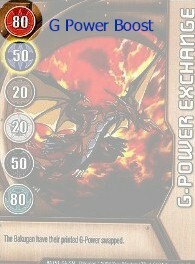 SUPER ASSAULT (Gundalian Invader)- Super Assault is the new name of Gundalian Invader's Special Attack Bakugan. Several of them are also Special Evolution Bakugan, extremely powerful Bakugan that can only be played later in the game. SEASON 3 - Special set of Bakugans from the third season along with introduction of Battle Gears. Set K is the first set for 2010, with set L and M to follow. Some of these Bakugan will have two equidistant tabs and a magnet in their back when open, which allow Bakugan Battle Gear to be attach on them. Also the color schemes for some attributes will be changed. Over a very short period of time Sega Toys has released many different series, or varieties of Brawlers, from the first release of Series 1 to current BakuPearl, BakuSwap, B2, it is no wonder many consumers finding it confusing indeed. We tried very hard to provide you a complete listing of the Bakugan balls, included the newly released Season 2 Bakuneon (Bakuneon New Vestroia). BakuBronze, BakuGlow and BakuSteel - New and very limited releases. B3 Series (BakuBronze, BakuGlow, BakuSteel, BakuCrystal, BakuFlip and BakuCore) - New Season 3 New Vestroia with more powerful characters and increased G-Power. They're the same size as B2 and in very limited supply. BakuNeon - Bakugan Season 2 New Vestroia. These B2 sized bakugans have higher G-Power and greater integrate details, with lots of cool special features added to them. The new Bakuneon cards that accompany them promise to bring new life into your strategies. BakuClear - B2 version with clear see-through outer layer. It can take form of opponent's attribute. Packs include cards from Set C. Included clear and pearl figures. BakuPearl - Limited edition in milky pearl color, with attribute color as highlight. This series introduced larger B2 ("Bigger Brawlers") marbles (32mm), with higher G-Power. It also included B2 "Pearl" Bakugan (white Bakugan with attribute color highlight). Packs include cards from Set B, including (as usual) Gate cards matching the figures. BakuSwap - Released around November 2008. Introduced Dual Attribute Bakugan, with "swapped" parts. B2 - Current production version the size of ping pong ball (32mm), featuring more g power then previous Series 1 and 2. Chrome - B2 version with polished outer chrome ring. Deka - These are giant size Brawlers the size of a soft ball, when open it can reach over 4". Dual Attribute - This new release let you choose between two attributes during a battle. Evolved - Bakugan with metallic band around the side or down the center. Reverse - Bakugan with new reversed color schemes. New and very limited edition. Series 1 - Earliest version also the smallest size (about 28mm). As well as basic Bakugan, figures are available in several color variations - Pearl, Translucent, Clear and Translucent with Pearl highlights. These figures were also available in Series 2 packages (with Series 2 - Set 1 cards). Series 2 - Release around 11/2008. Series 2 introduced a new rule set, and new cards, but has the same marbles as Series 1 (28 mm). Packs include cards from Series 2 - Set 1, which has Gate cards for all figures except Siege (which had a matching Ability card). This was the last set before the larger B2 figures. Translucent - B2 version with translucent outer layer. More category? Please let us know. 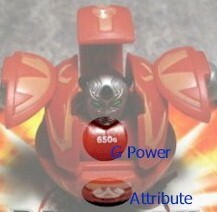 Each Bakugan Battle Brawlers has a G power rating, as well as one of the six attributes that determine the color of the brawlers. During a battle usually the higher g's give you an edge determining the outcome of the game. The Attribute determine the G Power Boost (in addition to the G power rating) you are able add based on the Gate Card you landed on, when you match the brawler's attribute against on the back side of the card. For example illustrated below the total G power will be 730 points (650g+80g=730g). However the G Power Boost can be negative value and therefore can negatively affect the outcome of the game. Each of the Bakugan Battle Brawlers has one of the six attributes (or elements). Pyrus can be found at the inner core of the Universe and is inhabited by Bakugans who draw their strength from the excruciating heat that surrounds them. It is within these deep recesses of molten rock that their intensity is forged. Never one to waste even a second, the Pyrus blitz their enemies from every angle like a raging firestorm. Pyrus is sometimes referred to as "Nova"
Buried deep below a blanket of dark waters, a deceiving air of tranquility fills Aquos. On the surface all appears calm and still, but in that silence lurk deadly warriors, proficient in all saturated environments. Aquos Bakugan seamlessly glide from one attack position to the next, constantly preparing for their moment of glory.Aquos is sometimes referred to as "Aqua". Darkus is located on the Dark Hemisphere of the Universe and is home to Bakugans who are grandmasters in night fighting and causing destruction. Years of study and intense training have allowed the Darkus Bakugans to thrive in Battles hidden deep in the shadows of the night. It is within these shadows that the Darkus Bakugans grow in strength. Darkus is sometimes referred to as "Darkon". Haos' skies shine bright, leaving a lasting effect on even the most protected eyes. A mystic aura emanates from the planet. A colossal source of power is the center of the planet, which draws energy from all matters of light. It is under this mass of activity that the Haos Bakugans have discovered the mythical ability to control and manipulate light and energy. Haos is sometimes referred to as "Luminoz". Subterra?s rugged exterior prepares its Bakugans for the hard and cruel Universe that awaits them. Dividing their time above and below ground, the Subterra Bakugan perfect their craft of combat with a highly intense level of enthusiasm. They are one with the land in which they live and their Battle style suggests nothing to the contrary. The planet of Ventus is swift and silent yet within its borders lurks a vicious cycle that overwhelms intruders and punishes them for trespassing. The Ventus Bakugans are fast and powerful like hurricane winds. Once their enemies get caught in the eye of the storm, they are defenseless to the Ventus' wrath. Ventus is sometimes referred to as "Zephyroz".